3 Bedroom Semi Detached House For Sale in Sheffield for Guide Price £180,000. A unique opportunity has arisen to purchase this modern and deceptively spacious three bedroomed semi-detached home which is situated on a quiet cul-de-sac in the heart of Mosborough Village boasting fabulous views to the rear. 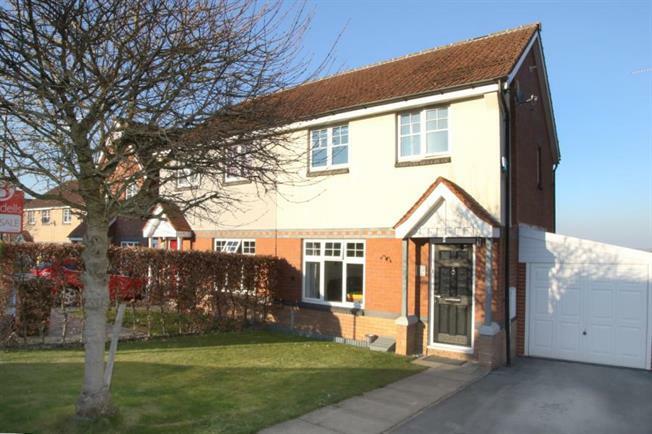 Having a driveway with single garage providing off road parking, two reception rooms and attractive family bathroom. Benefitting from uPVC double glazing and gas central heating. The property is well positioned for fantastic local amenities, road links to the City Centre and is within close proximity to a good choice of local schools. The ideal family home which must be viewed to be full appreciated. The accommodation in brief comprises: Entrance hallway with stairs rising to the first floor landing and a door into the front facing lounge, the lounge benefits from laminate to the floor and double doors lead into the dining room. The dining room has a good sized under stairs storage cupboard, French style doors lead out to the rear garden and is open plan through to the kitchen where there is a range of wall and base units with integrated appliances to include: gas hob, electric oven, extractor fan, along with space and plumbing for an automatic washing machine and fridge/freezer. First floor lading with loft access and storage cupboard, rear facing master bedroom having a pleasant rear outlook and a range of built in wardrobes, front facing bedroom two and bedroom three with built in storage cupboard. Family bathroom having an attractive contemporary three piece suite in white comprising: wash hand basin, low flush wc, P shaped bath with shower screen and mains shower above. Tiling to the walls with built in shelving, tiling to the floor, spot lighting, extractor fan and ladder towel radiator. Externally: to the front of the property is a lawned garden area, with side driveway leading to the single garage having up and over door power and lighting, a rear facing courtesy door accesses the rear enclosed garden. Rear garden is mainly laid to lawn with decked sun terraced, outside water tap and steps descend to an Indian sandstone flagged sitting area.